Guitar technique has always been the main subject of discussions amongst guitar players. Thanks to technique, we are able to play anything we want. Our "guitar common sense" should guide us in not abusing it. Technique gives "colours" to what we play. For example, a smooth legato, Holdsworth-style, is definitely in contrast with Gilbert's picking power. All this makes our way of playing more personal. My aim is to provide a guitar player with a comprehensive "vocabulary" of all techniques. It is then up to each player to use it with feeling. This cannot be taught as it belongs to each individual's awareness. 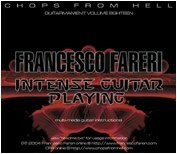 The TOTAL SHRED guitar course was created to improve shred technique, so you'll study: Alternate Picking, Legato, Tapping, Sweep Picking, String Skipping, Combinations, Coordination, Control, Speed. You can study also: chords, scales, modes, theory and more. Lessons are 45minutes long. The lesson include a copy of the album Universal Collision. 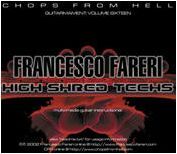 Francesco Fareri during the years wrote and recorded a lot of guitar lessons for web-magazines and more sites. 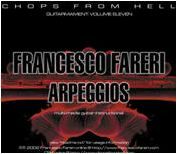 He collaborated with the Italian guitar magazine CHITARRE, AXE, MUSIC OFF and Japanese YOUNG GUITAR MAGAZINE.